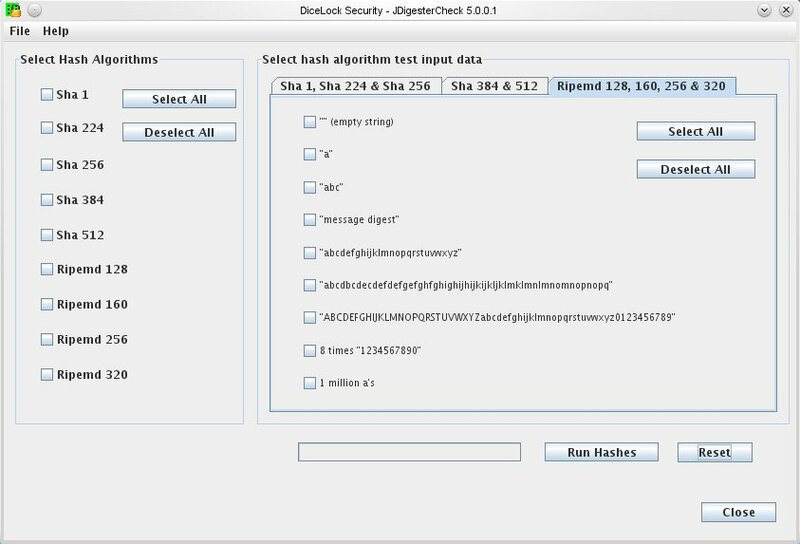 FREE DiceLock Security JDigesterCheck Java GUI and JHashDigester .jar extension library - Incorporate hash algorithms in your applications. JHashDigester .jar extenson library contains classes implementing SHA 1, SHA 224, SHA 256, SHA 384, SHA 512, RIPEMD 128, RIPEMD 160, RIPEMD 256, RIPEMD 320 hash algorithms. Linux installer. Requires Java version JRE 1.6.0_29. ...... JHashDiegester .jar extension library contains classes implementing SHA 1, SHA 224, SHA 256, SHA 384, SHA 512, RIPEMD 128, RIPEMD 160, RIPEMD 256, RIPEMD 320 hash algorithms. Unpack JDigesterCheck.tar.gz to any folder you like and execute from shell JDigesterCheck.sh. Qweas is providing links to JDigesterCheck for Linux 5.0.0.1 as a courtesy, and makes no representations regarding JDigesterCheck for Linux or any other applications or any information related thereto. Any questions, complaints or claims regarding this application JDigesterCheck for Linux 5.0.0.1 must be directed to the appropriate software vendor. You may click the publisher link of JDigesterCheck for Linux on the top of this page to get more details about the vendor.